Typically I shy away from books on tape that are read by the author – I mean, if you’re a talented writer, chances are you are not a talented reader. To be a good reader for a book on tape, you practically need a stage voice, an actor’s voice. 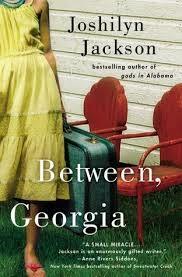 Joshilyn Jackson’s Between, Georgia is quite the exception. This is the second of Jackson’s books I’ve listened to – the first being God’s in Alabama, which, by the way, was not read by Jackson. I have a third book by her – The Girl Who Stopped Swimming – borrowed from a friend & on my TBR pile, and this experience is making me want to see if I can find it on tape instead of reading it. There is not much worse than a put-on Southern accent. I had that with my last book on tape. Likewise, you don’t get much closer to heaven than an authentic one when the language and tale match the drawl. 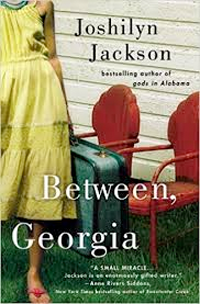 Joshilyn Jackson nailed both – Between, Georgia is thoroughly Southern. Between, Georgia is the story of Nonny Frett – a girl in her 20’s caught, well, between. Between two warring families on opposite sides of the tracks – her blood and the one that raised her; between a marriage that is over but she’s not quite free of; and most importantly, between who she is and who she wants to be. And while all this sounds pretty trite, this story is anything but ordinary. And the plot? Well, let’s just say that there are some things that are only believable if they happen in the South. You just don’t get away with poisoning dogs or callin’ in your cross-the-state-line cousins to burn something unless you’re below the Mason Dixon. With this novel, Jackson plunges her stake in the ground and rallies the gray horses as an authentic Southern voice in today’s literature. Here we are in Saluda–entertaining ourselves with your blog and book reviews. Listen, girl–you have three superb English teacers and one widely read librarian whose eye candy is the New Yorker avidly reading your reviews and being blown away with your gift with words. Your Mama's head is so big we may not be able to get her out the door to go to the book sale. India is listening and we have decided that a book on tape will be as easily accepted. Sooooo you now need to start on your debut novel which we will all buy!!! You can thank us in the dedication, for we have all played a role in your development and have led you to love the written word as much as we do. Love you Beth!! !